Pumpkin Bread is probably my favorite dessert on earth, or at least one of them. This recipe is the only recipe that I have been using for decades without changing a single thing in the recipe. I make it any time of the year, but especially around the holidays when pumpkins are in season. I guess there’s one thing I’ve changed: I use fresh pumpkin instead of canned. Initially because I couldn’t find canned pumpkin in Italy, and more recently because I don’t use anything other than fresh. I’ve never transcribed this recipe onto my computer or my recipe database. 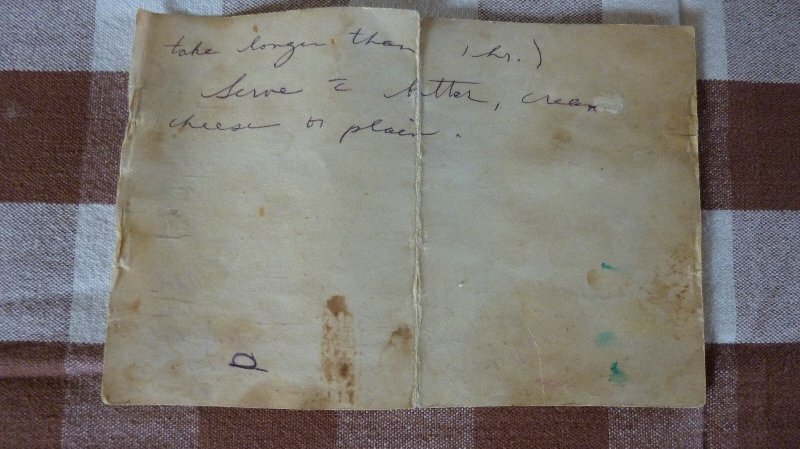 Instead, I pull out the note card with the recipe from a little recipe box I still have and use that. Over the years, the card has yellowed and it’s gotten little bits of pumpkin and other ingredients stuck to it. I’ve halved, doubled, tripled and quadrupled the recipe in pencil. But it’s still the same handwritten note card I was given years and years ago. I first had this pumpkin bread, fresh out of the oven with butter and cream cheese, at my college boyfriend’s mother’s house (his name was Basil) and it was delicious. Basil’s mom wrote the recipe out for me and I’ve been using it ever since. 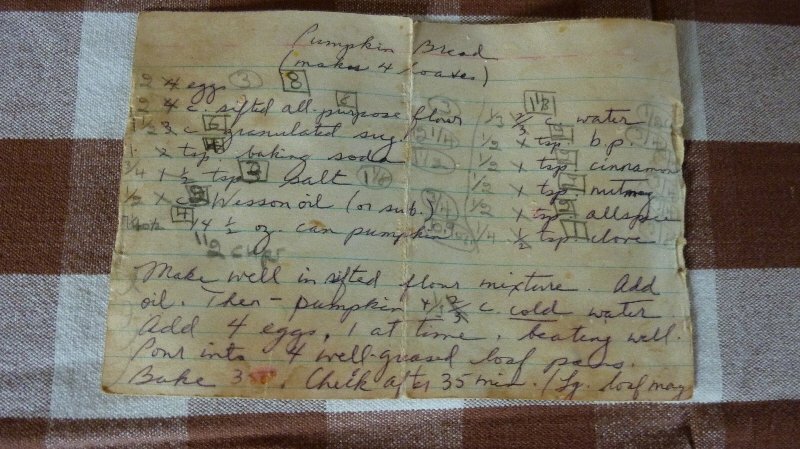 I look at her handwriting and think of her each time I make the pumpkin bread: a delightful, loving woman dedicated to her husband and sons. And a great baker. And now I’ll share this recipe with you, even the notecard…. Make well in sifted mixture of all dry ingredients. Add oil, then water and pumpkin. Add 4 eggs, one at a time, beating well after each addition. Pour into four well-greased loaf pans. Bake for about an hour, but check after 35 minutes. Large loaves may take more than one hour. Serve warm or at room temperature with butter, cream cheese or plain. This bread looks great! Have you ever thought about framing that beauty of a recipe? That way you could still use and and be preserving it, such a treasure!